I have spent several hours this week stripping the old “Tour of America” graphics off our Airstream. This is something I really should have done long ago, perhaps even in 2008 when we officially ended our full-time travels and settled into a house without wheels, but for sentimental and laziness reasons I kept putting the job off. We loved the graphics. They made our Airstream unique and a reminder of the 1,000 happy days we spent traveling America. People would ask us where we got them, or if they indicated that our trailer was a rental (apparently confusing Airstream and U-Haul). Many others would say nothing but take pictures when they spotted it. Emma confessed that while attending rallies as a small child she would use the decals as a way to find her home among dozens of other Airstreams. The graphics were custom-designed by Brad Cornelius for us when we launched in 2005, and at the time I expected they would be on the Airstream for less than a year. The people who applied them assumed the same, and so I have nobody to blame but myself for the fact that ten years later the decals had fused to the Airstream’s clearcoat in a very stubborn way. The final impetus to remove them came last year, when the two decals that faced south began to crack and peel off like a bad sunburn. I knew that getting them off would be a problem, because I had removed the largest decal back in 2010 and it took several days. Back then I was going the chemical approach, using all kinds of nasty carcinogenic goop, none of which worked particularly well. I tried a heat gun and plastic scrapers and all sorts of things, but it was still a huge hassle—and in the process I managed to scrape off the Airstream’s clear coat in two places. This time I tried a 3M Adhesive Eraser Wheel, and it was a huge difference. It’s basically a polyurethane grinding wheel that you put on a drill. The wheel cost me $32.99 locally, which turned out to be money well spent. The wheel strips off the vinyl and the underlying adhesive without damaging the clear coat at all. You can see how this works in my short YouTube video. Then I followed up with a few applications of Goo Gone to clear up the remainder. Unfortunately, you can also see how the graphic in the video demo is leaving behind a “ghost” image of itself. That particular bit of vinyl was facing southwest while the Airstream was in storage, and it got the most sun damage. The vinyl actually embedded into the clear coat and caused permanent damage. If I had removed it a couple of years ago it would have been fine—I just waited too long. Oh well. Now that I’ve got the entire graphic off and cleaned up the surface, it actually looks kind of cool. From some angles it’s like a silver image cast into the aluminum. I may eventually have that panel stripped and re-coated by P&S Trailers the next time we are passing through Ohio, or maybe we’ll just design a new vinyl graphic to cover up that spot. One other graphic also left a mark. The others (which were in shade during storage) came off cleanly. It’s hardly “stealth” with AIRSTREAMLIFE.COM still emblazoned on either side and the rear, but the Airstream is much more subtle now. I think we’ll operate like this for a while, until we decide what personalization we might like next. Yesterday we wrapped up Alumafiesta in Tucson, and so now we’re in the “recovery” phase, just trying to get back in sync with life and unwind after a hectic week. For me, it’s time to get a few Airstream projects done. In the first week of January I decided to do something I’ve never done before: take a friend out in the Airstream for a week-long trip, instead of my family. It might seem odd that I’ve never done that, but those of you who own travel trailers or motorhomes can testify that they become very personal. I always associate our Airstream with our family. 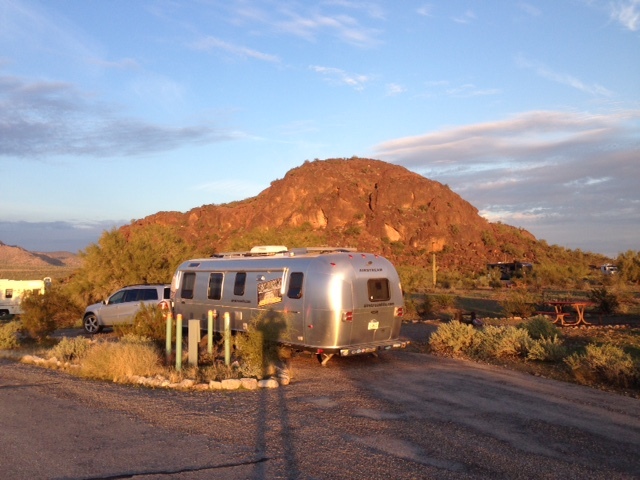 I rarely even take the Airstream out alone. But my buddy Nick was a pretty safe bet. He’s low-maintenance, easy-going, and a decent cook. We work on our old Mercedes cars together on weekends, and have spent many a Saturday morning digging around the junkyard, so we’ve bonded over greasy parts and underneath diesel engines. At one point Nick mentioned that he and his wife would like to own a small travel trailer someday, so I figured he was ready to get introduced to the world of Airstream. 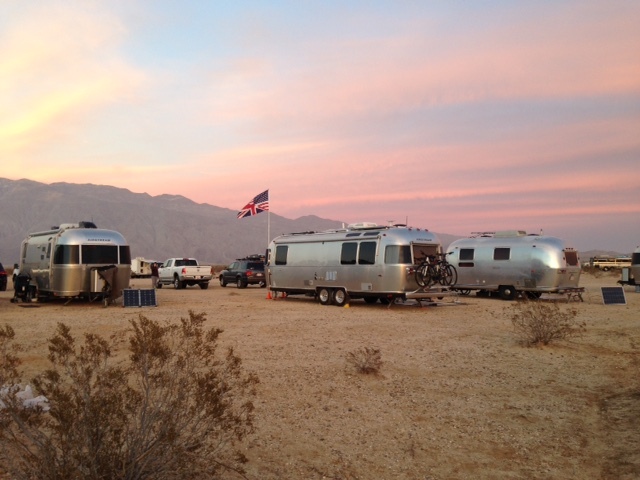 We took the Airstream out to the southern California desert, where we met up with a bunch of other desert rats/technomads, went hiking, and ate apple pie from Julian. Then we hopped over to Quartzsite to see the spectacle of cheapskate boondockers and endless flea markets, and we wrapped up the trip with a hike up Picacho Peak in Picacho AZ. It was all brilliant except that the Airstream kept giving us little problems, signs of advancing age and frequent hard use. I already wrote about the battery charging issue, and that will get addressed later this month when the new charger comes in. During the California trip, I found a few other glitches, most of which I fixed on the spot. One interesting problem was the sudden failure of the P/T valve on the water heater. This valve is supposed to relieve excess pressure in the water heater (it’s a safety device) but mine decided after ten years it was done holding back, and so it began to gush water. One trip to the local hardware store later, Nick and I had it swapped out for a new one. All of the repairs were small stuff like that, hardly worth breaking out the tool kit for, until the aluminum bracket that holds up the dump valves broke loose. Even this wasn’t a major problem. The bracket is riveted into the belly pan, which is thin aluminum, and the rivets had finally torn out after 100,000+ miles of bumping along North American roadways. The dump valves hung a little lower than usual, but everything still worked. My only concern was that eventually, without the bracket, the connections on the plastic pipes might eventually start to leak. Normally I’d fix this with bigger rivets—which I carry around at all times, as well as a rivet tool—but in this case there wasn’t enough intact metal in the belly pan left to make a bond I could trust. It needed a reinforcing sheet of aluminum. I browsed around the junk piles at Quartzsite and found an expired California license plate that was the perfect size to serve as a reinforcing plate. I was feeling rather resourceful until it became obvious that the entire dump valve assembly would have to be removed in order to get in there with the drill and rivet tool to rig up my field repair. This was more of a job than I wanted to do in a Quartzsite campground (we had opted for full hookups rather than boondocking again), and it seemed like an opportunity to order a new set of dump valves to swap in at the same time. So after getting home, I placed an order for the new valve set and went off to Alumafiesta for a week. Alas, the day before Alumafiesta I heard a strange hissing noise from the refrigerator, one I’ve never heard before. The refrigerator used in RVs is normally silent. There wasn’t any obvious ammonia smell (a definite indicator of a major failure), nor any sign of coolant leakage, and the fridge was still working so there wasn’t anything I could so at that point. A few days later, the fridge stopped cooling and a tell-tale puddle of greenish-yellow coolant oozed out. RIP refrigerator #2. It lasted just six and a half years, one of the 900,000+ victims of Dometic’s unfortunate refrigerator manufacturing fiasco from June 1, 2003 to September 30, 2006. The immediate solution was to find another refrigerator to store my food for a few days until the event was over. The long-term solution was to order a new cooling unit for the refrigerator. The cooling unit is the guts of the fridge, and it’s entirely replaceable. We could get a new refrigerator, but we really like the Dometic NDR-1062 that we have, and it has been discontinued. It’s the only model we’ve found that yields 10 cubic feet in the space of a typical 8-cubic foot refrigerator box. Meanwhile today, I got under the Airstream and swapped out that dump valve set, and riveted that bracket up. It was a good warm-up for the work yet to come this month. At times it seems like I’m constantly working on one Airstream or another. This can be frustrating at times because there are other things in life. On the other hand, each repair is an opportunity to get to know the Airstream better, learn new skills, and improve things beyond the original factory spec. There’s something very satisfying in doing it yourself. And I can assure you that those dump valves will never drop low again, thanks to ten huge rivets and a California license plate.